Great link! Lots of useful info in there... thanks!!! I'm going to look into fabricating some kind of roller guide or something; I'm not thrilled with the idea of the clutch cable rubbing on the bottom of the bracket or being so close to the headers like in his pic. But thanks for the pic though...gives me some ideas. Any Europa owners that have removed the rear hub....does the nut come off WITH the bent-over flat washer or do you straighten out the washer first then remove the hub nut? Straighten the washer first. You may also need heat; some people assemble with lots of Loctite. You will (almost) definitely need heat to remove the hub, since if it has been assembled properly, there will be Loctite on the splines. Thanks! That's just what I needed to know. Straightened the washer, used a 38mm socket with 1/2" breaker bar and the nut came right off. What kind of heat on the hub...heat gun heat or gas torch kind of heat? You really need to read up on this, to avoid any frustration or expensive mistakes. There's a ton of info on jerry's site, lotus-europa central. On one of my hubs, it came apart easily, the other, well I broke two pullers in the attempt. Finally got it with an acetylene torch with a third puller in place. A real wooly-booger, for sure. Frankly, I don't think that particular hub NEEDED a nut or safety washer! In my case, a heat gun, or propane torch did not suffice. Your results may vary. I had to heat it, until the locktite bubbled up from around the splines before it released. Please avoid the feeling you can pound this out with a hammer. The uprights are fragile, and are hard to come by. I have been reading up on it; the workshop manual and whatever else I can find but most of these sources seem to assume you are already familiar with the procedures, which I'm not. Which is why I'm asking before doing anything, precisely because I do in fact want to avoid mistakes, expensive or otherwise. I really appreciate the help and links! Mine succumbed with a propane torch, though it took a while. I'd be a bit careful with the higher temperatures of oxy-acetylene or similar; odd, unwanted stresses may be set up. Well the good news is...with a few turns of the socket, the hub came loose and slid right off. The bad news is apparently there wasn't any loctite on it as it wasn't difficult to extract at all. I used a 3-prong puller which worked fine. 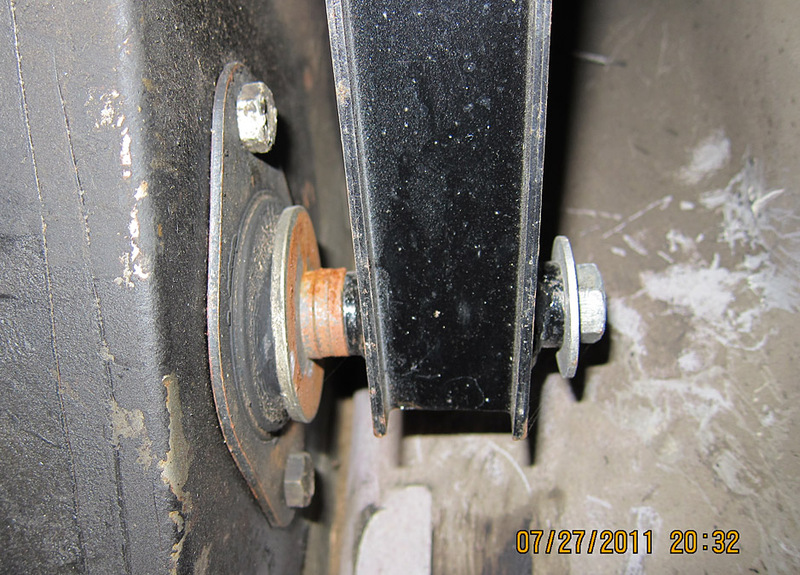 The hub came off and the four bolts holding the brake assembly came off easily. After reading the workshop manual carefully and studying the actual assembly it looks like I have to unbolt the radius arm at the front so it can drop down below the body level, so I can begin moving the arm outward enough to unbolt the 4 bolts on the back of the hub area, since they can't as-is be removed because the u-joint is in the way. The new radius arm arrived from Banks Europa and it's beautiful; which is good and bad, since it makes the other side look like dirty crud lol. But I'll just clean and inspect the other side. I bought some 303 which I'll use on the areas I'm not replacing which will hopefully improve the looks as well as provide some protection. So far, the muffler was NOT bolted to the trans (just sitting loose on the suspension bar); the headers (although rusty) were barely more than finger-tight; and the rear hub on the driver's side doesn't appear to have been loctited the way it was supposed to be; the crankcase breather pipe was completely missing so the quarter-sized hole in the side of the engine is just open to the air. I'm going to start going through and checking everything now; even assemblies that "appear" to be okay. Just for safety and thoroughness' sake if nothing else. U joints are a common failure point on these things. All related to the fact that the halfshaft is doubling as a suspension link. And the bearings & spacers within the hub upright also commonly fail. The looseness of the spline-to-hub area may actually be an indicator of a loose bearing-spacer stack up. Are you havin' fun yet? Lol yeah, loads of fun. This one side has the damaged radius arm so I won't be surprised if something else in that assembly group needs repair/replacing. Not a deal breaker, just something that has to be taken care of. Finally got the damaged radius arm out. The hardest part was getting the brake line that was attached at the top inside front of the arm; it was a royal pain trying to get a wrench in there. 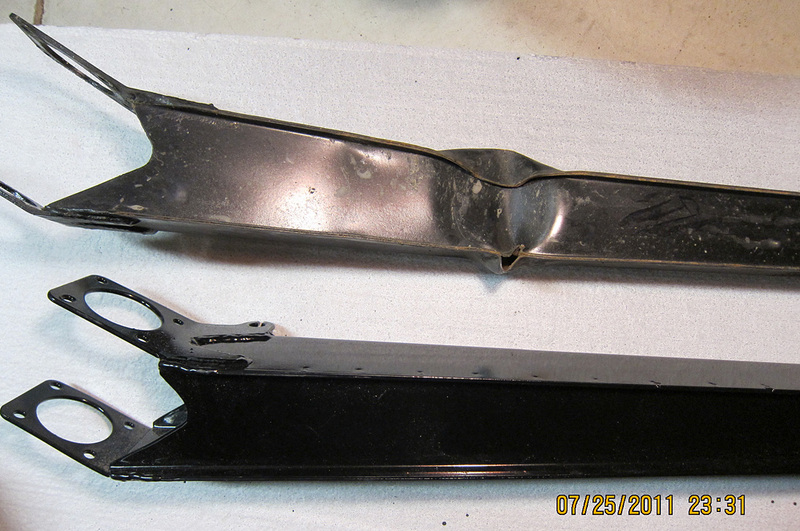 Here are a couple of pics that show the damage to the arm I removed. I put the new arm from Banks Europa next to it for comparison; the damaged one was bent quite a bit. There was no heat required to extract the halfshaft from the spindle; using the extractor it came out without any drama. I know from reading the workshop manual you're supposed to use washers between the radius arm and the frame at the front to adjust toe-in, but there weren't any there when I removed the arm. Can you use slide-in shims to adjust toe-in? It would be a monumental PITA to have to pull that bolt out just to add a washer to make an adjustment. Last edited by EuropaFan; 07-25-2011 at 11:23 PM. The toe adjustment washer fits between the radius arm and the mounting bush. It's only 7/16" (from memeory) so there's no way a slide-in shim can do the job. It really doesn't take much to remove that bolt, as long as it's the right length. Ah, well that may be the thing then; I'll have to check the length because the bolt would not come out without rotating the arm downward, which was only possible by disconnecting the lower link and shock. 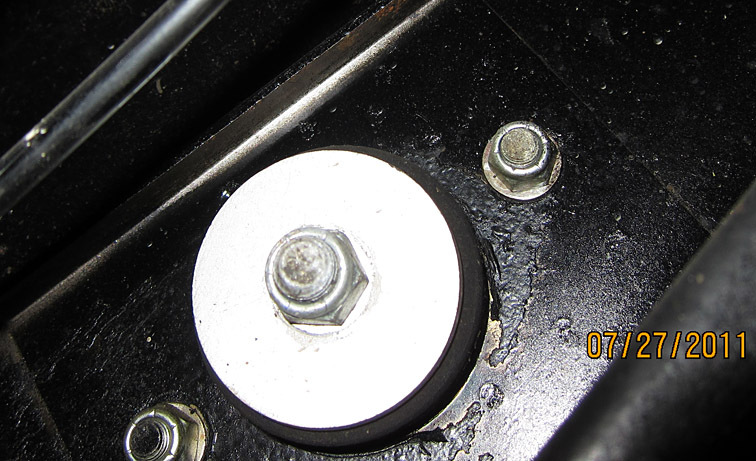 The bolt and nut look fairly new compared to other bolts on the car so it may have been replaced at some point in the past. There wasn't a washer at all when I removed it; nothing between the radius arm and the frame. Man, that thing took a lick! It had to have rattled the previous owners teeth when it happened!! great pictures of you progress, keep it up! I'll bet it got like that 'cos some nincompoop stuck a jack under it!. Surely the bolt went into the mounting bush, not the frame? Anyway, measure the length, it's not standard off-the-shelf. If you buy 'em too long they're a b... to get out. Don't ask how I know, please. I don't remember where I heard it but I was told years ago that the rear toe-in was set really high (lots of toe-in) from the factory. I don't know if it was false, poor Q/C, or on purpose to be extra safe (since excessive toe-in in the rear is more stable). I could believe any of them. I do know that when my car was new, it ate rear tires at a prodigious clip which could be a symptom of excessive toe-in. In any event, you need to make sure you set the toe with respect to the center of the car, not just the other tire or you could crab down the road. I have a Dunlop toe gauge (a mirror setup that measures toe between the wheels) and because my rear suspension is completely adjustable, I didn't trust myself to align it on the center line so I took it to a shop. I had started with regular washers and they did use a couple of the of the slide in shims. I would have preferred regular washers, but none of them ever came out. They would be more hassle, though. You might also make sure you got the correct radius arm. TC and the TCS are not the same. I believe one difference is the bolt hole radius for the upright - but then, you'll find out soon enough ! I took a couple of pics of the passenger side which didn't have any damage and I noticed it had 3 small washers and a large washer (the rusted ones) between the end of the radius arm and the frame mount. The driver's side which had the damaged arm didn't have any of those; the arm was next to the frame. And the bolt and washers on the damaged side were not rusty at all compared to the passenger side which were, so it appears that someone in the past (perhaps not so distant) had attempted to remove the damaged radius arm but gave up and didn't put all the washers back. The large one on the other side (inside) of the frame was there (as illustrated in the pic below). So tomorrow I'll go to the hardware store and get another large washer for the driver's side to get it set up properly. From reading the workshop manual it seems to indicate that toe-in should be somewhere between 1/16 and 1/8" but those washers on the inside of the passenger's side are 1/8" each. Between the large one and the 3 small ones that's a full 1/2" of toe-out. I pulled the passenger side bolt just to see about the length and sure enough, when pulled out it was just long enough to completely clear the hole on the frame and allow the radius arm to drop enough to add or subtract washers. The bolt on the driver's side was exactly the same length so I'm assuming the difficulty I had was the result of that arm being bent out of shape so badly. I removed one of the small 1/8" washers from the passenger side which I'll put on the driver's side. There's no question the toe-in/toe-out is absolutely wrong on both sides so this will at least give me a starting point when everything's finished to get the rear properly aligned. Also, don't worry about the 1/2" stack of washers vs the toe-in spec of 1/16" - 1/8". The toe-in measurement is taken at the tire, whereas the washers are some distance away at the end of the arm. A 1/2" stack at the arm end may indeed equal 1/8" or so at the tire. From reading the workshop manual it seems to indicate that toe-in should be somewhere between 1/16 and 1/8" but those washers on the inside of the passenger's side are 1/8" each. Between the large one and the 3 small ones that's a full 1/2" of toe-out. If only it was as easy as measuring a stack of washers to put on that bolt! Bainford has it correct. The size of the stack of washers is relative. It's only a means to get the correct angle on the rear tires to the center line of the car. It might even end up that the stack of washers on one side is taller than the other. It is pretty surprising that you only had washers on one side! I'm also surprised that you didn't see any irregular wear on your driver side tire. I guess the guy who was careful enough to destroy your radius rod was just as careful with the rear alignment. If you're going to give it to an alignment shop, I would start out with the same height stack on both sides and let the shop do the rest. That should be close enough to start. Let us know how everything works out!